With his first three films Okaeri, Not Forgotten and Asakusa Kid all charting distinctively different courses, Makoto Shinozaki is a certainly not an easy director to pigeon-hole. After producing the long-running, DV-shot omnibus series Cop Festival, with his latest directorial work Walking with the Dog he takes a bold plunge into that much-maligned cinematic sub-genre of the family-oriented animal drama. He brought both works with him to Korea's dynamic Puchon International Film Festival, but wisely opted to leave the dog back home. Jasper Sharp met up with him for a chat about working with animals and former child actors. Can you tell me what inspired the story for Walking with the Dog? So who wrote the script for Walking with the Dog? The project itself started with the producer and the scriptwriter, Kei Shichiri. He is an assistant director on a lot of pink movies. Traditionally films featuring dogs are very popular in Japan. During the last two years there have been five of them. The producer thought it would be pretty boring to do just another film about a dog and how cute he was, so he wanted something where the dog is the centre of the drama. Quill, the adaptation of the book Modo-ken Kuiru no Issei, about guide dogs for the blind, of course has recently come out, directed by Yoichi Sai, but just for the record, we were actually making our film first. As soon as he found out about the therapy dogs, the producer contacted Tooru Oki, who appeared in the film. Oki has been living in the States for 20 years, and working as a blues singer while he is training therapy dogs. He wants to introduce the concept of using these therapy dogs all over the world, especially in Japan. It's a kind of real story. Most of the dog trainers who appear in the film are dog trainers in real life, except two of them, who are actresses. Why do Japanese love dog movies so much? I don't know why (laughs). Actually I love dogs, but I don't really have a chance to keep one. There's no time to feed it and Japanese apartments are too small. I have to confess, I am not a dog lover at all, so I was amazed I liked your film. It's very powerful. I was almost crying at the end. I prefer cats. Please, make a film about cats. There are of course two kinds of people in Japan too - people who prefer cats and people who prefer dogs. People say that whilst dogs are attracted to people, cats are attracted to places - where they live, not to their owners. I don't believe this, personally. I really like cats, but this fact makes cats more difficult to film. They don't take directions very well. What is it like working with a dog as your star actor? None of the dogs in this film were "star dogs" from a dog acting agency. These were real therapy dogs, who are just doing on screen what they do every day in normal life. Even the main dog, Tamura. I was astonished. It was amazing. How did you direct him? I didn't do anything! Honestly, I did nothing! I just suggested things to the dog trainer and the dog just did what the trainer said. I told him what sort of image I wanted, and the dog trainer just coordinated this. Which was your own favourite? I don't want to make any enemies here! Actually I saw Sayonara Kuro when we were in pre-production for Walking with the Dog. I was very surprised to see how easy it was to edit a film like this showing the close-ups of the dog and the close ups of the people. But some of the scenes in Sayonara Kuro tried to avoid this shot-reverse-shot approach, shooting the dog and the people in the same frame in long shot. It was very impressive, so I wanted to do something like this. I discussed it with the cinematographer. This cinematographer, Kenji Hagiwara, is in his 70s now, and he has a lot of experience in the industry. He used to be Seijun Suzuki's cameraman. He shot Elegy to Violence, for example. Also he worked on a lot of Japanese idol movies as well, with stars like Momoe Yamaguchi. There was that great scene in your movie where the police try to catch Tamura and Yasuyuki, all done in one single shot. Was that difficult to shoot? Actually there were no tests for that scene. People were surrounding the park to stop the dog from getting out. I just wanted the people to run out, so it was a kind of improvisation, but it worked! But during this scene the dog ran out of the scene and between the people surrounding him. The dog ran down the street, and we found him later waiting patiently by a traffic signal. What reaction have you had to the film? In Japan it was screened in a number of small cinemas, maybe with around 100 seats, so it was not so commercially successful, I think. But everyone who saw it liked it, so I am relieved. I also won a prize in the Shanghai International Film Festival, but I couldn't go to collect it. Was Walking with the Dog the last screen role of Tomio Aoki? About two years ago Tomio Aoki was diagnosed with cancer. He was kept in a hospital for a while and had some fairly major surgery. The operation at first seemed successful and he was let out of the hospital. As a form of rehabilitation, I made up my mind to make a series of short films with him on digital video. I made 7 or 8 of them. The shortest one is about 30 seconds, the longest was 5 minutes. Aoki-san was not so well at the time. Even though the operation was successful, he wasn't up to running, for example, or doing any real action scenes. After he came out of the hospital, he went to live with his son, and so I shot a lot of the films in the parking area outside his son's house. As you know, Aoki-san was once known as a child actor, called Tokkan Kozo, which means Dashing Boy, so this series was called Tokkan Jijii, which means Dashing Old Man. Some of the videos were screened at last year's Vancouver Film Festival as part of the Ozu retrospective. So the longest part, the five-minute one, was actually based on a story by Abbas Kiarostami. He once told me this amusing anecdote, about 7 years ago, and I asked if I could make it into a film sometime. He said it was fine, but I don't think he actually remembers saying this. This film also featured Kiyoshi Kurosawa and Hiroshi Takahashi, the screenwriter of the Ring series. Aoki-san suffered from a relapse with his health and went back into hospital just before we started shooting Walking with the Dog. I asked if he would be allowed out to appear in the film, and he came and played the scene of the old man who is visited by the therapy dog. It was very tiring for him but he enjoyed it. Several times he looked really sick, and started breathing really heavily, and we all started worrying. But then he said "What are you worrying about. I'm acting!" Actually before he was due to go back to the hospital, he checked himself into a hotel for one night and said he was going out drinking with his friends. It is very sad that he is gone. He was one of my best friends over the past ten years. I know you are very interested in horror movies. Why do you always make such nice films yourself? Actually I made a lot of 8mm movies when I was younger, and these were either horror or action. The first I made was when I was 14 years old, in junior high school. I made a 5-minute short film called Shooting. The story is five or six people just shooting each other. That's all. Then I remade Dawn of the Dead in 8mm when I was in high school. I had to develop my own special FX - the blood squibs and the makeup for the scars. I really want to make horror films now, but no producers have picked up on my interest in the genre. Actually I already made a short film called Nobody Home - the Japanese title is Rusuban Bideo, meaning 'video answering machine'. I originally made this story in 8mm in 1989, and this year I remade it on digital video. It's 35 minutes long, with no blood, but very scary! What influence has Kiyoshi Kurosawa had on you? It's difficult to say. Of course, I've been very influenced by him. He is very special for me. He is the original. So I'm not quite sure what kind of influence he has had, but yes, he has had an influence. We graduated from the same university, along with Shinji Aoyama, Kunitoshi Manda, and Akihito Shiota. After we graduated we all used to get together and talk about making movies a lot. While Kurosawa was preparing to make Cure, for example, I did a lot of research on hypnosis and gathered him a lot of references and documents. Also, in the early drafts of the script for Cure, there was no character for the protagonist's wife. When he went back to his apartment there would be traces of her existence, like the washing machine running in the background, and the protagonist muttering to himself like Anthony Perkins in Psycho. Then he saw my first feature, Okaeri, and decided to change the script to introduce a wife character. So perhaps by showing our films to each other, there must be some sort of influence. But both he and I are trying to do something very different. If ever I come up with a good idea for a horror movie which is very different from Kurosawa's films, then I would like to make it. Actually I really want to make a movie out of the horror manga Shiyo no Koe (Voice of the Tide) written by Ryoko Yamanishi. This manga is very much influenced by Nicholas Roeg's movie Don't Look Now, and it is the most horrific comic that I have ever read. Can you tell me a bit about the Cop Festival (Deka Matsuri) project? This is rather a long story, but basically what happened was that an independent theatre in Shimokitazawa in Tokyo wanted to show Asakusa Kid, but for some reason we couldn't do this. So I said that if they wanted, I could make a film for them in a very short time for them to screen instead. I had been talking with Kurosawa-san and some other directors a while back reminiscing about when we first started making our own short movies, so we thought it would be nice to go back to those days. We had the idea of putting together an omnibus of 10 short movies, all shot digitally by different directors, such as Ryuichi Hiroki, Shinji Aoyama and Kunitoshi Manda. Then we thought it would be good to organise it around a single theme. So we thought of all the jobs the main protagonist could have, like a doctor or a nurse, and thought that the one which would give us the most leeway would be a cop, because cops take many forms, from traffic patrol men to plain clothes investigators. We also thought it would be better to have some rules as well for all of us to follow, rather like Lars von Trier's Dogme project. 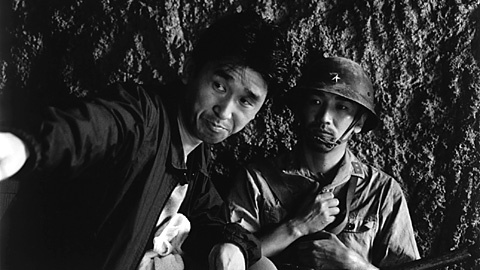 Kurosawa-san thought that the Dogme rules, of for example only using natural light, no post-dubbed sound, were a little dull and pointless, so we made them a bit more wild. One of the rules in the first series was that the films all had to star Susumu Terajima and all had to feature one "gag" every minute. We wanted to see if Shinji Aoyama could make a funny movie! The first Deka Matsuri film came out in January 2003, and the second one a few months later. In the second film, all the cops had to be women. We are now on part five.